Before I jump into Amtrak’s route structure, it bears pointing out that since I live in the West this series has a definite focus on rail service in my part of the country. As Jim Morrison of The Doors muttered twice in his iconic song The End: “The West Is the Best”. And boy, was he ever right! Nonetheless, you’re going to get well acquainted with Amtrak service throughout the United States by the time this series is complete. It's a big country. Originally, I was going to write just one chapter about Amtrak’s routes but I realized after starting that not only was it too much to write, but even worse, it would be way too much too read at one sitting. The first three chapters will provide a look at all of Amtrak’s long-distance routes. Long-distance for our purposes means trains that travel overnight at least one night from origin to destination travel overnight. Following long-distance trains, the next two chapters will examine Amtrak’s short-distance corridors. Finally we’ll see how they fit together. Amtrak has excellent resources available for research. Each route reference below contains a link to the relevant Amtrak.com page where you’ll find a route map and route guide, list of all the stations served, timetables, accommodations, policies, and plenty more. We’ll begin with the north-to-south trains. 6 long-distance trains operate in a mostly north-to-south orientation. All north-south trains are two days in total duration (only one overnight from origin to destination). For example, if you left Los Angeles on a Monday morning you would arrive Seattle on Tuesday night. In the West, the only north-south train is the Coast Starlight between Seattle and Los Angeles. The principal cities it stops at along the way include Tacoma, Portland, Eugene, Sacramento, Oakland, San Jose, and Santa Barbara. While “Coast” is part of the name, the portion that is actually along the coast is just from roughly Ventura to Pismo Beach. It’s beautiful, and much of it you’ll can only see by train because the highway (U.S. 101) runs inland from Pismo Beach to Gaviota (south of Buellton). Except for glimpses of the San Francisco Bay and the Puget Sound, nothing else that could be considered coastal. But the route is outstanding from start to finish, and provides a survey of the three Pacific coast states that takes in most of its great cities, agricultural areas, and wilderness. One Amtrak’s weaknesses is that it offers no other north-south service until the midsection of the country, and not all that much there. More or less paralleling the Mississippi River is the City of New Orleans between Chicago and New Orleans. Its principal stops along the way include Memphis and Jackson, Miss. 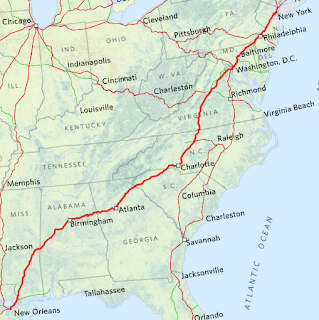 The Crescent runs in a northeast-southwest diagonal, connecting New York with New Orleans. The principal cities it serves include Washington, D.C., Charlotte, Atlanta, and Birmingham. 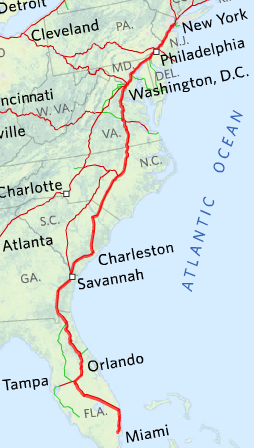 Three trains connect the Northeast with Florida. Two of them operate similar and to some extent overlapping routes. The Silver Star and the Silver Meteor both begin in New York and end in Miami. The Silver Star, however splits into two sections in Orlando, where one section continues to Tampa, whereas the other section continues to Miami. 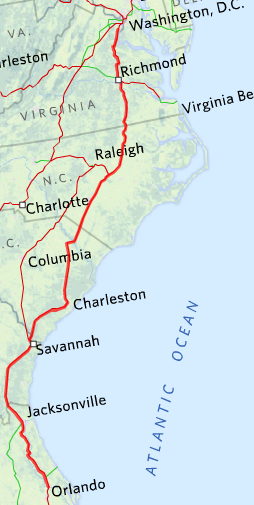 Both the Silver Star and Silver Meteor serve Washington, Richmond, Virginia, Savannah, and Jacksonville, but the routes in the Carolinas diverge. 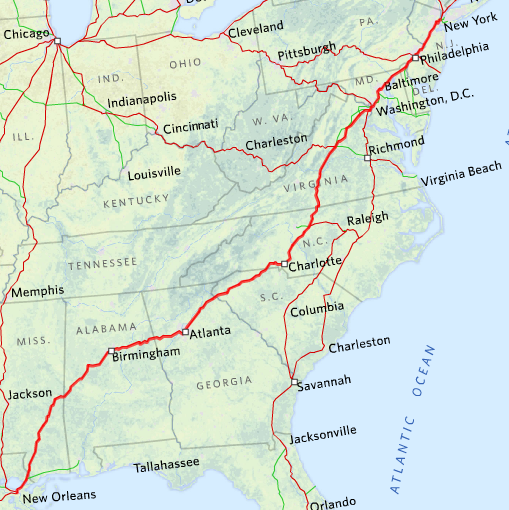 There is one more long-distance train that operates along the eastern seaboard: Auto Train. This is a unique train for two reasons. One, is that it operates without any passenger stops from Lorton, Virginia (close to Washington, D.C.) to Sanford, Fla. (just north of Orlando) and, two, it carries passengers and their vehicles. I first really “got” the point about which I’m going to write in 2005 when I ran the Davis Stampede Half Marathon. Davis isn’t too far from Chico, Calif. where I live; it’s 100 miles away, and about an 1 hour 45 minute drive. We walked two blocks to get here! My partner Keith and I chose to drive down the day before and stay overnight at a Best Western two blocks from the race start. We arrived the afternoon before the race, picked up our race packets at the local running store, got a good night’s sleep, and walked two entire blocks to the start of the race. A light went on and has burned ever since, and now that I operate a hotel reservation booking service for business travelers, I have the opportunity to propagandize (in a good way) my clients, many of whom are both runners and business travelers. When you’re doing a big running event out of town, you owe it to yourself to get the nicest hotel room possible, striking the best balance you can between cost and proximity. You’ve trained for a marathon putting in untold hours and miles over many months time. It’s quite likely you’ve gone through two or more pairs of running shoes in training. Why would you want to put that entire investment at risk by staying in a hotel that is far from the race start (or transportation to the race start), or so cheap that a good night’s sleep is problematic? It’s a clear-cut case of penny wise and pound foolish. The most important thing you can do is be rested for the Big Race, and not have an undue stress level added to an already early morning start by having to drive a long distance to the start of the event, with all of the potential for car trouble, traffic jams, or a frustrating search for parking. Is money tight and you’re doing this marathon on a budget? Then economize by ditching most of the post-training run meals and beers with your buddies, and put the money you would have spent in a jar and save it for a hotel room. Believe me, you’ll be glad you did. Now if you have the option of staying with friends or relatives that can be a good money-saving alternative to a hotel, provided it is relatively close to the start of the race. But if your hosts are not interested in what you are about to do, then your free lodging may be more of a nuisance for them, what with your needing to get to sleep early the night before, and then rummaging around early on a Saturday or Sunday morning. Should that be the case, consider redeeming this "free room" for another non-running occasion. Plus part of the fun of staying at a hotel is soaking up the energy of all of the other runners doing the same thing. Final tip: if you have a long drive or flight ahead of you after the marathon, strongly consider staying over the night after the race if your schedule and pocketbook permit. Not only will you not have to scramble to shower and pack to beat the hotel check-out deadline, but your sore and cramping legs will thank you for not having to be cooped up in a car or plane. For most people, flying on commercial aircraft is a pretty ho-hum affair. While present day flying isn’t very glamorous, and certainly the on-the-ground check-in security procedures now are sheer drudgery, a nonstop flight for distances of 500+ miles is still the best – and sometimes the only – way to go. One out of eight Americans shuns commercial air travel according to the figure cited in the Bay Area’s “Fear of Flying Clinic”. A good friend of mine, Robert Moran, told me that up until recently he was one of those “one out of eight”. He traces his anxiousness about flying back to an incident as a 6-year old on his first flight. There was a minor problem with the aircraft, but even before that he began taking up the fear evinced by his two grown-up traveling companions. For many years as an adult, he avoided flying altogether which made for very lengthy car trips back to Mississippi where he grew up and where his family still lives. (Robert and his wife live in northern California.) Over the last few years, he embraced better flying through chemicals by getting a prescription for a mild sedative to batten down the fear factor, but the aftermath he experienced after reaching his destination wasn’t pretty: exhaustion and disrupted sleep patterns. 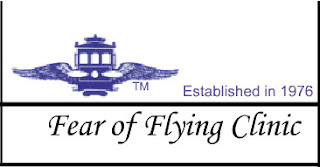 Funny thing was that the doctor who prescribed the flying meds had also been a nervous flier, but had benefitted from the program offered by the Fear of Flying Clinic (FOFC) at the San Francisco Airport. He recommended it to Robert. In June over two consecutive weekends, Robert went through one of their clinics and emerged much less fearful. In his own words, “[T]hough by no means cured, I actually look forward to flying now and have many coping mechanisms that have put me on track to conquering this long-term problem”. The therapists and airline professionals (pilots, flight attendants, mechanics, etc.) who conduct the clinics for the non-profit FOFC, take participants behind the scenes to see how planes fly and how the air traffic control system works. In essence, they demonstrate that commercial air transport is indeed complex, but it is also routine, and very, very safe. And those funny noises planes make at the start, end, and sometimes in the middle of a flight are normal. It’s a cliché but true, that you face more danger on the drive to the airport than you do on the flight itself. While not an obligatory part of the clinic, Robert and his other FOFC classmates had a graduation day-trip on Alaska Airlines to have lunch in Seattle. Success! (And rather decadent, if you ask me.) Subsequently, Robert along with wife Karen and infant twin boys did another day-trip to San Diego to test his flight comfort level. More success! How much longer from now will it be, before Robert contemplates the “mileage runs” that some frequent flyers do, to ensure elite status in an airline’s mileage program? For further information about the programs operated by the Fear of Flying Clinic see their website. Readers outside of northern California will find FOFC has a list of links to similar resources elsewhere in the United States and Canada.